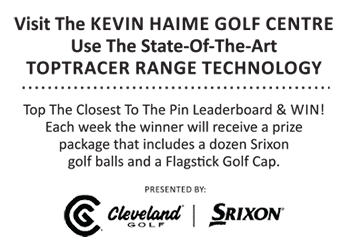 This past winter, along with Titleist Canada, we ran a Titleist Fitting Experience contest. The goal was to showcase the brand new Titleist Canada National Fitting Centre at Eagles Nest Golf Club in Vaughan, Ontario. It recently opened and allows the company to provide world-class club fittings year-round. We had many, many entrants, with the winner scheduled to be awarded a full golf bag fitting and a Titleist prize pack. John Rennick of Brockville was the lucky winner and he eventually walked away with a lot more in prizes than he ever imagined thanks to the generosity of Titleist Canada. Rennick was treated to a VIP experience, receiving a clothes and footwear package prior to his fitting. He was then greeted at the Fitting Centre with a new Titleist golf bag with his name embroidered on it, ProV1 golf balls, gloves, and even a Team Titleist T-Shirt. At the end of his fitting an order was made and Titleist provided him with a new 917D driver which will be on his doorstep shortly. Not bad for simply being a subscriber to our TeeTalk newsletter and submitting a free entry to the Titleist Fitting Experience Draw. For more information on the new Titleist National Fitting Centre visit this link.